(2013/REEL TIME) 10 tracks 1967 incl. 'Study In Motion #1' by The Poor. Soundtrack by St Phillips & Chuck Sedacca. 04 Skip To Mary J. Now Stu Phillips is one of the folks who live on the hill. He overlooks some sumptuous rolling Tennessee countryside just north of Nashville. Better than most, he knows how far it is from his birthplace near Montreal, Canada to Nashville. It isn't just a physical distance either. The journey would have been a hard and long one even if he had come by a direct route, but Stu Phillips detoured through the west, a detour that shaped his mind and his music. He has the restless intelligence of the self-made man (his first album called him "serious minded"), and a desire to better himself and his lot in life which has led him back and forth across the north American sub-continent, down some blind alleys and up and down the 'Billboard' charts. Even now, after more than twenty-five years in and around Nashville, his voice still has the Canadian burr as he settles down to talk about it. Unlike many artists, Stu Phillips tells his own story most eloquently himself. He was born January 19, 1933, and as he says, "1 always called Calgary my home town, but I was born in St. Eustache, which is a little town just outside Montreal. One of my very first recollections is of my mother singing a song called 'You're The Only Star In My Blue Heaven', which was a Gene Autry song, and I followed her in becoming a Gene Autry fan. I must have seen every movie at least five times. "St. Eustache was something of a french stronghold, and even though I didn't sense the conflict between the French and the English at the time, I can see it now in retrospect. I was fluently bilingual at one time. We lived as neighbours then and shared traditions, but I don't think I'd he comfortable there now. "I joined a choir in Montreal, the choir of St. George's church, a pretty renowned boys choir I came to Calgary When I was in my early teens. My father was a railroad architect. He built hotels, sheds, stations and so on, and I ventured out west with my father. He was working on a project out there. My father and mother went back, but I stayed out west. "I feel in some ways I was denied my formal education because we moved around a lot, and we were a poor family, but to make up for that I was really aggressive when 1 was a kid. I counted a lot on my talent, not only for singing but for public relations work. The one exception was when I went to work for the Alberta government department of Mines and Minerals. I was twenty then, and I became an understudy to the person who calculated all the oil royalties for the department. I had a flair for figures, and after a year's study the man whose job I had studied for retired, but 1 was con-sidered too young to take his place. I was really disappointed, and instead of waiting for another promotion opportu-nity I went and applied to one of the local newspapers, 'The Edmonton Bulletin'. But, after three days there was a shortage of newsprint paper and the other newspaper in Edmonton, 'The Edmonton Journal', purchased the 'Bulletin' and I was out of a job. "I looked across the street and there were the flashing letters of radio station CFRN. 1 arranged for an interview and an audition that afternoon, and they asked me to come back at five o'clock. They said, 'You have a tremendous voice, but you can't read.' I said, 'If you think I have a nice voice, give me a little time, I'll practice and practice. Just give me a chance'. The next day, they called back and said they'd give me a technical job and assign me wire service copy to read. The technical job 1 had was to operate the controls for Omar Blondahl, who was on Rodeo Records. Omar had some personal problems at that time, and wouldn't always show up. One morning he didn't show, and I had been directed to just play records. That morning, I took the initiative and played the records, announced them, did the commercials and figured I'd either get a job on-air or get fired. When the production manager came in, he was angry, but he ended by saying that I sounded good. He gave me a little show very early before Omar came in. As it happened, Omar never came back to work, and I used to grab my guitar and sing on-air. That was my break. "1 went to see a man at Ace hardware store and talked him into sponsoring me on a fifteen minute radio programme with me and a bass and guitar. Then I went to a saturday afternoon talent show, and then I started writing. I discovered there weren't many songs with Canadian content, and that's where I found the uniqueness in my material. I began to read all kinds of folklore and Canadiana, and I wrote 150 or 160 songs based on Canadian folklore. 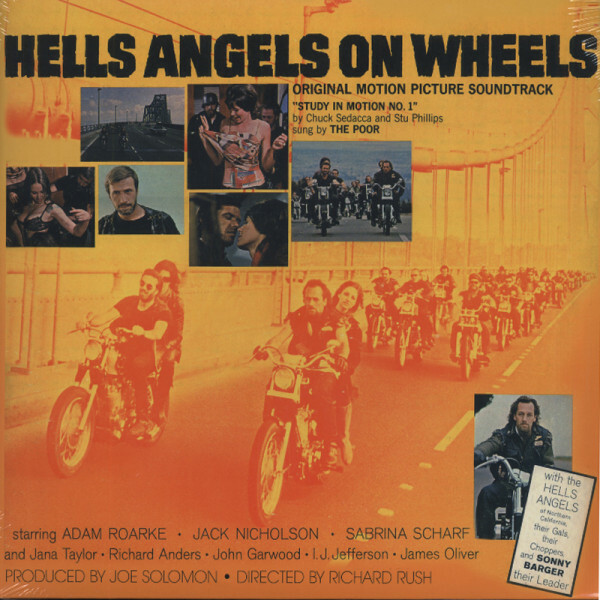 Customer evaluation for "Hells Angels On Wheels - Soundtrack 180g Viny"